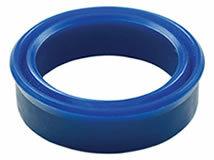 If you cannot find the sealing you need, our special, non-binding form may help. In many cases you can still use one of our seals. 1) special,symetrical lip seal. Application e.g at Atlas cylinders .